This actually is the front of my house. 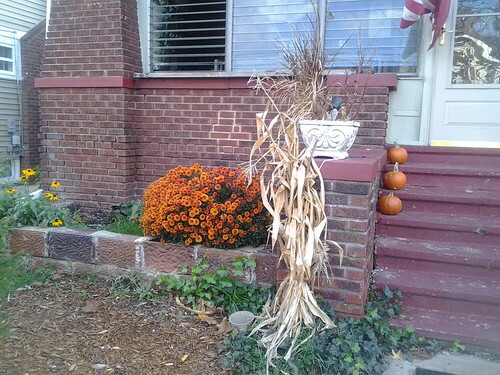 The mum I was so anxious to bloom finally exploded full reddish/orange blooms. It's so beautiful! My little ivy plant has grown a great dealt this year as well as you can see in the picture it even wants to climb up the stairs! that being the mother of sons isn't always the great gift it's cracked up to be. Boys want to assert their manhood, and part of being manly I guess is making sure your mother knows her place. And I've had just about enough of it. So here are some clues - guys, if you want to borrow a large sum of money from me, it's probably not a good idea to tell me that I'm annoying you when I call to see how you doing - considering I only make that call once a week. If you announce in the kitchen that you had a fight with your girlfriend, don't yell at me when the whole family knows about it. And, if I get upset because you throw an important notebook of mine out when you were cleaning the car, don't act like you were doing me some big favor- because fellas, that was your mess in MY car. And you just lost the privilege of eating and drinking in it! that I had some examples of a healthy mother/son adult relationship in the way my grandfather treated his mother as an adult. Because if I didn't have that, I would seriously be wondering if this was normal or not? Gabe and Noah are Reading the Autobiography of Frederick Douglas - perhaps watch the Crucible if I can find it. Apologia Science - Physical for Gabe and General for Noah and Izzy although Gabe and Noah are almost done with their books. Saxon math for all with math tutor for Gabe, Izzy and Rosie- considering Teaching Textbooks for Noah, although Mr. Pete wants to stick with Saxon Algebra with the math tutor. the final touches on my classroom today. 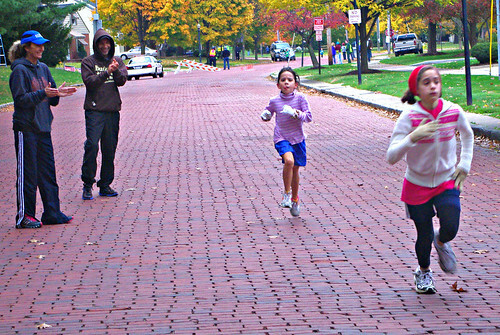 keep the kids running this week on our own in preparation for the Thanksgiving Day Race. Hoping to start up my video workouts this week too. Probably should start playing my flute again in preparation for the heavy Christmas season. The autobiography of Frederick Douglas with Gabe and Noah this week and of course the continuation of the Philadelphia Catholic with Izzy and the Golly Sisters with Rosie! the buzzing in my ears and the hum of the computer. 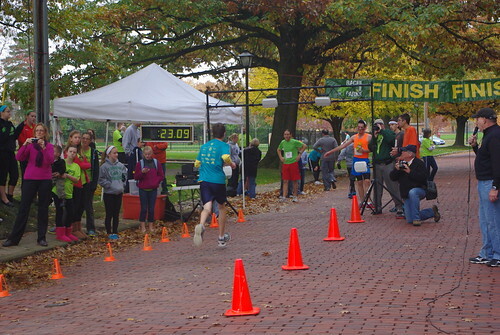 This is from the 5K at church on Saturday. Noah set a personal record of 23:09 - almost a minute off from a month ago. 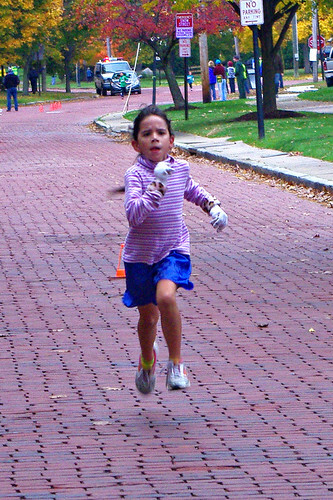 But the big surprise was Rosie- who ran the one-mile Fun Run and was the second female to cross the finish line. The girl that beat her was 12! Great daybook - thanks for sharing. 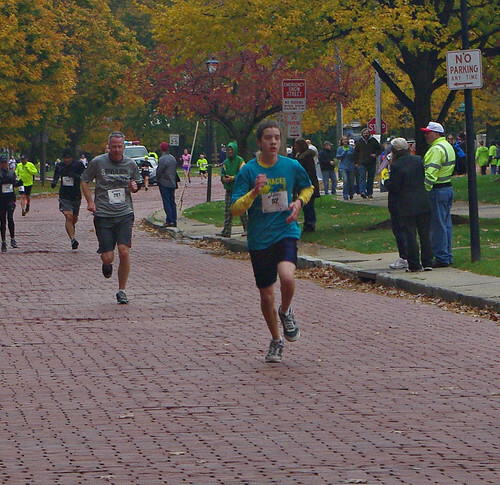 Love the running pics!